What If your realme smartphone won't connect to Wi-Fi network? Learn the reason why phone won't connect to Wi-Fi and how to solve it. * If you need to get connected to network immediately, it is recommended to temporarily use to avoid delays. 1. Make sure that your router is on and you're within range. If you're too far from your router, you can't get a signal, so you cannot connect to the Wi-Fi network. 2. If asked, enter your correct Wi-Fi password. If the Wi-Fi network you want to connect is encrypted, you need to enter the correct password. If the phone alerts "Incorrect password", enter the password again and turn on "Show password" for checking. * If a saved Wi-Fi network cannot be connected, click [Remove this network], then enter the password and connect again. 3. Update Wi-Fi settings on your phone. For devices of ColorOS 5.2 and earlier, go to [Settings] > [Wi-Fi (or WLAN)] > [Advanced setting] > [Saved Networks] and then we can edit. Here we can delete and search again and connect as per the requirement. Restart your realme phone and make sure Wi-Fi is turned on. 5. Check your router or cables. 1. Check if your router has serious abrasion, aging, corrosion or mechanical damage, and make sure it is connected to the modem. Restart the router and try to connect to Wi-Fi network again ten minutes later. 2. Check and make sure that each cable is connected firmly and not damaged. Try reconnecting again. 6. Try the Wi-Fi network on other phones. 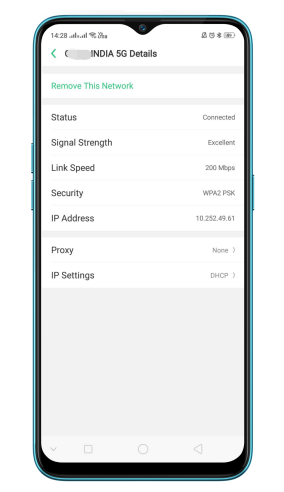 Try to connect to this Wi-Fi network on other phones. If other phones fail to connect to this Wi-Fi network, contact your network operator for help. Save your data first, then enter to erase data and reset the phone. Back up data, take your phone, proof of purchase and warranty card to visit a nearby realme Service Center for more help.